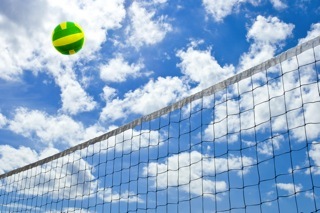 Welcome to Courtside Sports Medicine & Rehabilitation's patient resource about physiotherapy services for volleyball. There is a lot more to volleyball than jumping around in the sand on a beach in a bikini -- Misty May Treanor and Kerri Walsh proved that at the Olympics. This highly competitive sport requires an athlete to be in top shape, both in hand-eye coordination and athletic ability. The majority of volleyball injuries occur to the hands, wrists, ankles and knees. Plus, there is considerable strain placed on the muscles of the back through bending, as well as muscles that can be pulled and strained through repetitive jumping. This area of our site is designed to help you stay on the volleyball court, working on your spike. Whether you want to get better for your weekend volleyball game on the beach or for an intense competition that is on the hardwoods of a gym, we have the resources and information that will keep you healthy and active. Copyright (2017) Courtside Sports Medicine & Rehabilitation. All rights reserved.